Support each and every pupil, to achieve their full potential, both academically and personally, celebrating achievements, both within and outside of school. SMSC: Spiritual. Nurture and develop self-esteem and a self-belief for all pupils, so that pupils are prepared to take risks with their learning and learn from their mistakes. SMSC: Social. Provide a safe, secure and stimulating environment, whereby teaching and learning is challenging, engaging and inspiring, providing tools to aid enjoyment and enthusiasm, in order to reach the ultimate goal – success. SMSC: BV: Rule of Law. Empower all pupils to develop ownership of their own learning, thus fostering motivation and a love of learning, whilst building resilience, so that all pupils have the strength to overcome obstacles and barriers to their learning. BV: Individual Liberty. Foster an ethos of high expectations and aspirations for all. SMSC: Moral. SMSC: Cultural. Support each and every pupil to develop self-respect and to respect the opinions, feelings and possessions of others. BV: Tolerance and mutual respect of those with different faiths and beliefs. 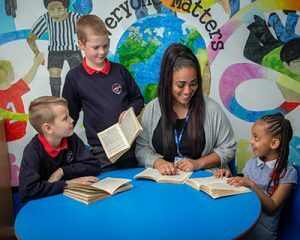 Provide all pupils with an equal opportunity to learn, share their opinions and to take part in all aspects of school life at Whitgreave, along with opportunities to develop life skills and experiences within the local Community and wider world. BV: Individual Liberty. BV: Democracy. Create a happy and friendly learning environment for all members of the Whitgreave Team, so that everyone feels valued and everyone feels welcome. SMSC: Social. SMSC: Cultural. Encourage the involvement of parents and carers in school life, working in partnership together, whilst encouraging and supporting parents and carers to develop their own skills and experiences. SMSC: Social. Develop an ethos, which underpins all aspects of school life, where everybody matters, everyone counts. SMSC: BV: Tolerance and mutual respect of those with different faiths and beliefs.